WILLIAMS MORRIS Tapestry and Needlepoint. Bell pull and cushion. 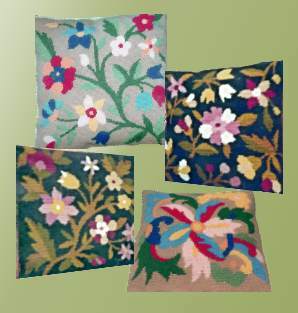 Needlepoint Tapestry & Embroidery - A Decorative Art to the Urchin Cut Time. To the left, a Design of the greater english decorator of the 19th century: WILLIAMS MORRIS. He was a revolutionar whose life and work shaped by a dream of a medieval Arcadia and ultimately a vision of a fraternal Utopia. He arranged all the elements of the decoration. Here it is a models of ceramics that we have adapted for a Bell Pull. The other side show a design of 40's years. Note the darkness line around the shapes, it is typicale of the style of these years. The other side show a Needlepoint design of 40's years. Note the darkness line around the shapes, it is typicale of the style of these years. The designs of these cushion look like those of the 17th century. Annie Bouquet draw one's inspiration from. The colors are modern and the simple stroke make easy to embroider. Needlepoint Tapestry kits contain the canvas hand painted with brush in full colour by Annie Bouquet 's Studio, yarn, a plated Gold needle, and instructions. The 100% cotton canvas is a double weave antique or white Monofil. The yarn is 100% pure wool "Medicis" from DMC France and others dyed specifically for us to Aubusson.